Braided Fishing Line, What Is It Really? This category of bass fishing line is surrounded by confusion. "Braids" or "superlines", which is which? Can they break your rods and damage your reels? Will knots from superlines hold? Are they worth the high price? Trying to sort it out can make your head explode! Today's braid fishing line is far removed from its early ancestors. Early on it were made from braided Dacron which was devoid of stretch, had poor knot strength, strongly inclined towards backlashes and were not the least bit abrasion resistant. In 2009 braideded lines were greatly improved, made not from Dacron, but from high performance "gel-spun" micro-fibers of modern day, high tech materials like Dyneema (Spiderwire, Fireline, Stren Sonic Braid) and Spectra (P-Line, PowerPro). These materials are forms of "polyethylene", which is plastic, and carry the description GSP (gel-spun polyethylene). Braided lines used for bass fishing are constructed by braiding together three or four individual strands (carriers) that are themselves composed of 4-5 dozen micro fibers each. This means that a normal four strand line will have 200-240 individual strands. The greater the number of strands the greater the strength of the line. Each manufacturer will braid the carrier lines according to its own formula and achieve different degrees of tightness of the strands. In order to increase the performance and abrasion resistance of braided lines some are coated with a tough polymer, like Teflon in the case of Spiderwire Stealth. These coatings are applied to some after the micro-fiber lines are braided together while others are braided after each individual mico-fiber is pre-coated. Fused lines are also coated, multi-strand braided lines. But they are taken a step further and fused by being subjected to a heating process. This creates a smoother surface that allegedly makes the line more durable. So, there is a distinction between "braided" and "fused" superlines though the terms are used interchangeably. As I understand it, "braided lines" are made from the weaving of micro fibers (man made) into a single strand and then weaving 3-4 of these (carriers) into a single line. "Fused lines" also consist of multifilaments, but they are ultimately converted to fishing line by twisting then "fusing, not braiding, multiple strands of micro-filaments together. Braided lines float because their weight ratio is less than that of water and their braided construction gives more bulk to the line than a single fiber will have. The final shape of such lines, at least those with four or more carriers (strands) is somewhat "square" despite appearing round. Present day braided fishing lines offer the bass fisherman many benefits over monofilament and fluorocarbon lines but also present a number of problems as well. Praise For Braids - Justified? Let's take a closer look at each of these and see what is good or maybe not so good about these traits. What's Line Diameter Have To Do With Anything? First, the smaller diameters of braided fishing lines enable you to spool a greater amount of line on your reels and you can do so with a stronger test line. For example, with 20lb test Fireline Braid you have line that has the same diameter as 6lb mono. This also means you will be able to cast further. Additionally, there will be less water displacement with smaller diameter line so not only will the bass be less able to see the line with its eyes but with its lateral line as well. Superlines are very strong, very small diameter lines which stretch very little. This creates a situation where you can easily slice your fingers if you become snagged and attempt to pull the line with your hand. Never wrap it around your fingers or hand and pull. The better method is to wrap the line around something like a branch or paddle handle, then pull. I keep a short wooden dowel in the boat for just this purpose. If you do become snagged do not pull back with your rod and reel. Besides causing the line to "dig into" itself on the reel, you stand the chance of breaking your rod. Use the following techniques and you will either get your lure back, straighten the hook or its eye or the line will break at the knot. With both instances get as close to the snag as possible before pulling. With spinning reels do this. Grab your reel so you can prevent the spool from slipping, point the rod at the snag and pull "straight" back. As for baitcasting reels, wrap something in the line just forward of the reel, point the rod at the snag and pull "straight" back using the inserted object only. I use the dowel I referred to above for this. Braided fishing line is stronger than steel (because of the materials from which it is made) by a factor of ten. That's an impressive statement but at diameters as small as .10mm it's really mostly hype. Braid lines can and do break though at far less frequency than monofilament or fluorocarbon lines. Nevertheless, this type line is the strongest line there is for bass fishing in relation to its diameters. By the way, don't try to bite through braid. You're teeth will ultimately lose the battle. A good pair of scissors, preferably serrated, will work well. Swiss Army Knife (everyone should carry one) scissors will not wear well against braid either so if you carry one spare it the punishment. Keep a dedicated pair of scissors in the boat for braid line. 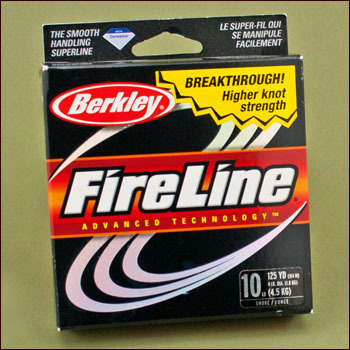 Berkley has a new device out that burns through braid and has cutting capability as well. I've not tried it but it looks like a good idea. It is interesting to note that many lab tests have shown that most all braid lines are stronger than they are rated by the manufacturer. The materials from which braided fishing line is produced are extremely strong. Nevertheless, most manufacturers coat their fibers with various polymers to enhance abrasion resistance. These coatings also make the lines smoother and slicker as well. When and if these coatings wear off will affect the line's performance. Always be on the alert for "fraying". Each company has its own "secret formula" relative to the coating materials and processes so as to set itself apart from its competitors. Experiment with several different lines and make your decision based on what works best "in your hands". Braided fishing line is quite limp compared to monfilaments and fluorocarbon lines. Braid fishing line is virtually devoid of spool memory and are very manageable on baitcasting reels. However, I've found them too limp for use on spinning reels. Could be operator error though. Also be aware that if your retrieve doesn't maintain constant line tension, as it doesn't when your working topwater lures or jerkbaits, line loops develop very easily. However, "fused" lines like Spiderwire and Fireline work well for me on spinning reels. In fact, these lines have a bit of stiffness to them when new which is the result of the coating process. Note that this will wear off over time and the line becomes more limp and even lighter in color. Since the loss of color occurs at the end of the line it is quite easy to cut off the last few feet and re-tie. This occurrence will be few and far between however. Superlines are long lived. They are tough standing up well to the rigors of fishing and not vulnerable to the effects of nature's elements so suffer little degradation over time. Because of this, once spooled, it can be used for a very long period of time, making it a very economical choice for the angler despite its substantial up front cost. A phenomena that occurs often and is particularly aggravating is the tendency of braided fishing line to dig into itself on the reel when setting the hook. We all tend to tighten our drags when we use heavier pound line. So, if we're using a 20lb braid which has the diameter of 6lb monofilament and we tighten our drag to compensate for the heavier rated line, the much thinner, slicker line will bury into the remaining spooled line. Then you sure enough have a mess on your hands. Unfortunately it won't make itself known till a few casts later when line leaving the spool hits the point of buried line on the spool. BACKLASH! BAD BACKLASH WILL ROBINSON! (If your too young to have ever seen "Lost In Space" you won't get that). Good luck getting the backlash out. You'll probably have to cut it off the spool. How do you prevent this? Just loosen your drag. I know, you think that will cause you to lose fish. Remember, superlines have virtually no stretch, so when you set the hook, even with a loosened drag, you're still going to get a good hook set. Just to be clear, when I say loosen your drag I mean just back it off a bit so it will slip just slightly when you set the hook. It needs to be lighter than you would have it set for comparable size monofilament. Also, you will be better off if you don't try and jerk the bass' teeth out with a power set because the lack of stretch will "lip rip" it. You will lose the bass not to mention ruin its day as well. With braided fishing line it's better to adjust your hook set to a one where you reel down and snap set or alternatively use a sweep set motion. When using braided superlines medium-heavy and heavy action rods should be put aside in favor of medium action rods that have a slowly tapered, fast tip and good backbone. These rods will better handle the lack of stretch in braided lines. "Superline, Meet My "Leetle" Friend, The Knot"
Braided fishing line and knots don't get along well. So we anglers must provide a little counseling and assistance to get them to play well together. 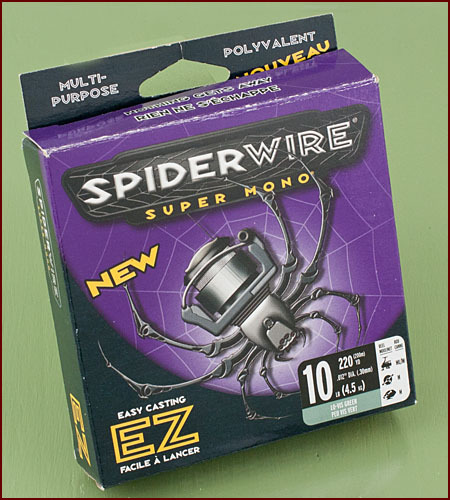 Since superlines are very thin and slick, they don't hold knots well. The Palomar knot is well accepted for superlines. I've used it for years incorporating a little Super Glue on the knot just to hedge my bets. If you want to use a fluorocarbon leader look to the Uni-Knot for joining the braid and leader. Add a little glue too. Another good knot developed by the folks at Berkley, is one called the "Braid Knot". Wonder where it got its name? Start off as with a Palomar knot by running a double loop through the eye of the hook. Then wrap the loop around the standing part of the line eight times before running the loop end back through the opening formed between the hook eye and wrapped coils. Cinch down and clip off the three tags. Do the following to reduce the severity of backlashes. Make a cast. Then pull out another cast length of line. Take a piece of electricians tape and place it across the remaining spooled line. Reel in your line. Now, if your line "digs in" or you should suffer a backlash, it will go no deeper than the tape making removal of the back-lashed line much easier. Braided fishing line, because it is so thin and slick, will tend to "spin" on the spool when under tension either when "spooling up" or fighting a fish. I read somewhere, unfortunately I don't recall the where, that there was an easy way to prevent this "turning" or "spinning" on the spool. Simply place a piece of 1/2 " "double sided tape" on the spool. This provides a surface onto which the line can grab and hold. Look for this kind of tape at Office Depot or Office Max.